James Quinton is a Landscape Architecture student at the University of Western Australia and fellow 3D illustration enthusiast. These two images are from his presentation to a design competition for a memorial park at the site of the Auschwitz concentration camp site in Poland. He won an honorable mention. 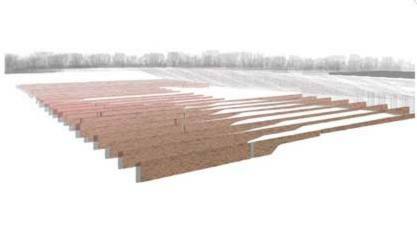 The first illustration shows the memorial’s main feature – a series of hedges embedded into a gently sloping hillside. 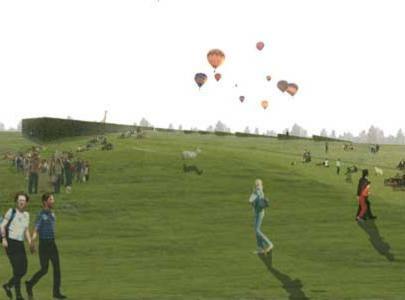 The second is a visualization of the memorial park populated with visitors. The ordered pattern of hedges mirrors, but abstracts, the regular rows of barracks in the actual camp which lies just behind the hedges. I immediately liked the way the hedges echo the actual camp but embed a feeling for the enormity of what happened there into the landscape. That’s just my take. You can see the whole project here. Scroll down to the bottom – James’ is the last one.